Although Nerf guns provide plenty of entertainment on their own, there are times where there is nothing more satisfying than eliminating your enemies with Nerf melee weapons. For those of you who are interested in getting a Nerf melee weapon of your own, here are the 8 best Nerf swords and other cool melee weapons. The Nerf N-Force Marauder Long Sword is one of the more popular options for those who wish to maintain a safe distance from their enemies but still pose a threat. 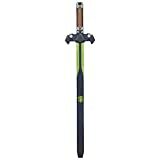 Unlike many of the other melee weapons offered by Nerf, the Nerf N-Force Marauder Long Sword offers a longer length of three feet, which does not include the additional length added by the hilt. Durable foam sword is the ultimate choice for hand-to-hand battle in all kinds of swashbuckling adventures! This sword is heavier than most, making it perfect for those who wish to disarm their enemies during battle. Be careful, however, the heaviness of the sword also makes it possible to hurt an enemy and it should be used with caution. Yet another long sword option for Nerf enthusiasts, The Nerf Zombie Strike Strikeblade is an apocalyptic-themed, light, three-foot-long blade and a medieval style hilt. While the previous option was a little bit heavier, this blade is made of a much lighter foam and it is both easier to wield with one hand and less likely to severely hurt your opponents. This blade is also perfect if you plan on doing a game zombie-related because you will already have the gear needed to fight off the zombie horde! Another shorter option for those who are skilled in close combat, the Nerf N-Force Klaw Hatchet is a small, well-built hatchet perfect for defending against other weapons or using as a projectile. 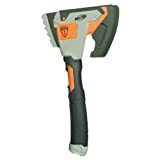 The foam on this industrial-style hatchet is much harder than other Nerf products, making it sturdier against other Nerf weapons but also potentially dangerous against your opponents. If you’re in need of a small melee weapon to carry around in case you run short of ammo, the Nerf N-Force Klaw Hatchet is the perfect choice. 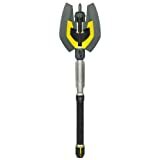 The Nerf N-Force Battlemaster Mace Axe is a monster of a weapon that is great for close range combat. At approximately two-and-a-half-feet long, the Nerf N-Force Battlemaster Mace Axe is a double-sided, gothic-style Axe that is similar to the Strikeblade in feel and use. The ultimate choice for hand-to-hand "combat"
Build your arsenal and prepare for "battle"
Made of a durable foam, this axe is both light to carry and strike with so you won’t have to worry about causing serious damage to your opponents. Overall, this is yet another great close range weapon for Nerf battles. This one also ranks high in the category of best battle axes. The Nerf N-Force Vendetta Double Sword is one of the most unique additions to the best Nerf swords on this list. 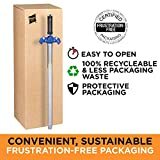 Unlike all of the other Nerf swords on this list, the Nerf N-Force Vendetta Double Sword is actually two swords that can be combined to form a double-ended sword. When combined, the bottoms of both sword hilts lock together and form one longer hilt with sword blades on both ends of the combined hilt piece. All that you have to do to put these pieces together is to twist the hilt ends together. To unlock them, all you have to do is press a button and twist them apart. When separated, the two swords are approximately two-feet-long and are very light and durable. Combined, the swords are about four-and-a-half-feet long and are durable enough to use constantly but light enough to strike down your foes without hurting them. If you are a lover of all things magical or medieval, the Nerf N-Force Warlock Axe will make a great addition to your Nerf battles. Similar to the Nerf N-Force Battlemaster Mace Axe, the Nerf N-Force Warlock Axe is a double-sided axe that is about two-and-a-half-feet-long. The foam is both durable and lightweight, making it an excellent choice for any type of Nerf battle. From a price point perspective, it's a little pricey. The Nerf N-Force Vantage Short Sword is almost the same as the Nerf Zombie Strike Strikeblade but with a more simple Nerf-themed design. 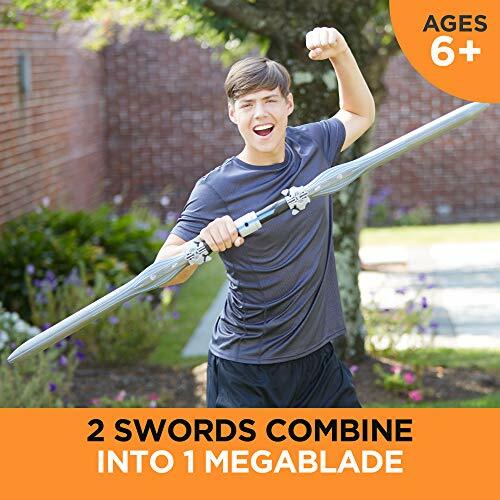 This Nerf sword measures in at about three feet and is made of a durable, soft foam that is perfect for intense sword fights and close combat. Overall, this one is very light to carry and makes for great fights, especially when you’ve got one in each hand! The final addition to this list is the Nerf Zombie Strike Z-Bat, another melee weapon designed specifically for zombie-based Nerf combat. The Nerf Zombie Strike Z-Bat is probably one of the more simple and more stylish weapons on this list, featuring that is wrapped in cloth towards the handle section and a top that is wrapped in foam made to look like a metal plating. The advantage that Nerf enthusiasts have while using this weapon is that it is more of a club shape than other weapons on this list, which makes it easier to bat off darts if you are using it in a real Nerf war. As a melee weapon for close combat, this is also an excellent choice due to its light weight and the ease of use when holding it with one hand! 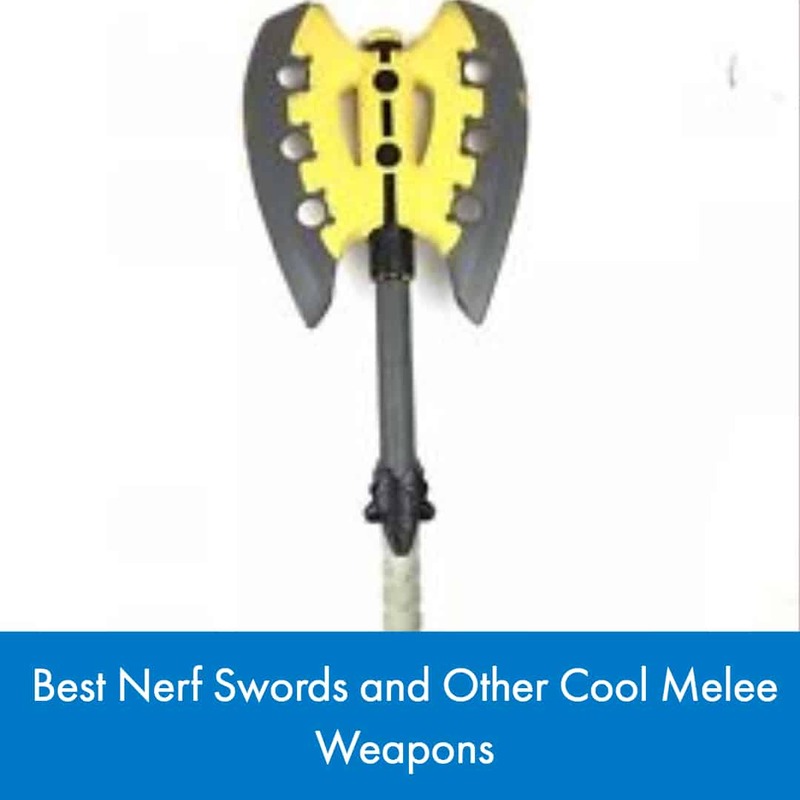 Melee weapons are great to use during Nerf battles and this list of awesome Nerf melee products should get you started on figuring out what kind of weapon you will need during a Nerf war! Was there anything missing from this list that you would’ve liked to see or do you need some additional ideas for melee weapons? If so, here is an excellent video that covers more of the Nerf melee weapons available. Nerf Modulus ECS-10 Review – What Makes it so Special! Dartdudes.com is a participant in the Amazon Services LLC Associates Program, an affiliate advertising program designed to provide a means for sites to earn advertising fees by advertising and linking to Amazon.com.